So there are these five guys, dunno if you’ve heard of them? This week, we take a look at Hero Jaejoong, U-Know Yunho, Micky Yoochun, Xiah Junsu and Max Changmin — known collectively as DBSK, and separately as JYJ and… DBSK. Now, I know Changmin’s chest has its detractors for being more on the… puny… side, but I’ve never been into the whole beefcake look (each to their own, I guess). But consider: that man cleavage you see there (and OK, the pretty lights too) intrigued me enough to hunt down and watch the “Keep Your Head Down” MV. 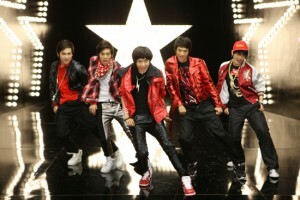 After that, I decided to look up some of the five-member stuff; somehow, the first MV I ended up watching was “Balloons“. I followed that immediately with “Mirotic” — and my head exploded. “Mirotic” is the only song (and MV) to have elicited a stronger reaction from me than “Lucifer” did, though I think watching the aegyo-filled “Balloons” just before may have had a hand in that. New K-pop fans tend to hear older fans talk of DBSK with such fondness, and such reverence almost — and it makes me so much more curious about the experience with DBSK that they’ve had; so I’ve enlisted Amy, Subi and Patricia to answer my questions. You don’t get to having the biggest fan club in the world with just pretty-boy looks and nice voices. What is it about DBSK that everyone loves so much? Amy: DBSK debuted at a time when there was relatively a lot less competition from other companies so they did have that leg up in terms of gaining fans. But aside from those external circumstances they couldn’t influence, I think they started out like every other boy group in the history of Korean boy groups. It wasn’t until they ventured to Japan that I think they gained most of their momentum as artists and were able to pick up a lot of fans who sincerely appreciated them for their performance skills and were able to win over skeptics. They went to Japan at a time when live performances weren’t a priority in any way and this was a huge factor in the quality of artists’ lives in Korea, and therefore DBSK’s. Subi: This is the toughest question you can ever ask a Cassie. They have talent. But not only do they have talent, they have some of the best of the best. Every single member has made it onto all sorts of “The Best” lists, from singer, to dancer, to whatever lists are quantifying these days. But they also have everything else that makes a hit idol group: personality, looks, etc, etc. But that still doesn’t explain anything because to some degree or another, every idol group has some measure of everything DBSK has. What separates DBSK from everyone else though, is chemistry. From the way their voices blend together in multiple part harmonies to the way they perform together on stage in sync while maintaining personal visual style, it’s like pieces of a puzzle. Each member is so perfect for the other member in every single way. Coupled with the fact that they have great music and great concepts, this is a group that can’t go wrong. Patricia: Not a lot of K-pop artists have achieved the same depth and breadth in their musical career as DBSK has. DBSK essentially had two full-time careers — one in Korea, and one in Japan, and they’ve managed to maintain both simultaneously. They’ve released eight full-length albums (four per country) within a five year period, and held seven concert tours (three in Korea/Asia and four in Japan) within a three year period. Apart from BoA, there hasn’t been another artist that’s been able to pull off two careers at once and release double the amount of material that’s expected from a regular K-pop artist. The fact that DBSK was able to compile such a large repertoire within such a short period of time is nothing short of impressive, which is perhaps why so many people hold DBSK with such a high(er) regard. But an impressive resume isn’t enough to call a group great. Frankly speaking, DBSK started out like any other K-pop boy group; the stuff that they released in Korea between 2003 and 2005 is no better (if not worse) than the stuff produced by many rookie artists in the K-pop industry today. 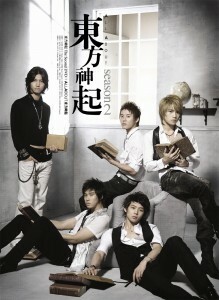 In 2005, DBSK became one of the first K-pop artists to make a serious foray into the Japanese market. Back then, entering the Japanese market as a K-pop artist wasn’t as easy as re-releasing an old Korean single recorded in Japanese. SM knew this, which is why they designed DBSK’s Japanese career so that DBSK would essentially be working from the very bottom of the industry upward. In many ways, the beginning of DBSK’s career in the Japanese market was a lot tougher than their debut in Korea, but this also made them stronger artists in the long run. It seems to me that DBSK approached the Japanese market with the mindset that they would have to work much, much harder than normal in order to even move a few steps forward in the Japanese music industry. Looking back on it, there’s a possibility that DBSK would’ve still been successful in Japan even without working quite as hard as they did, but they wouldn’t have been half the artists and performers that they are today. Considering DBSK’s success, I thought there would be many copycat groups, chock-full of vocals- yet, this has not been the case. I’m sure there are many reasons for why companies may not want to put all their vocalists into the one group, and that a group’s image, dynamic, and overall success are influenced by other factors as well, but surely someone must have tried? Amy: I think SM Entertainment tried to do that with SHINee, who I really do see as SM’s experiment in building the DBSK 2.0. As for other companies trying, I can see Cube doing that with Beast. While I don’t think Cube necessarily set out to make Beast a 2.0 anything, I think the way the group has played out has convinced me that Beast is another group that has all very well-rounded members, and who will only get better with time. I don’t think they’re necessarily going to become another DBSK — because love DBSK as I do, I don’t think DBSK is the end-all be-all of K-pop — Beast’s on-stage chemistry and abilities remind me of DBSK’s a lot. Subi: DBSK is not a “chock-full of vocals.” They’re chock-full of everything. Singers, dancers, lookers, and what not. And yeah, there have been attempts at replicating this. Like Amy said, I think SHINee is probably the closest thing there is. But one thing SHINee doesn’t have that DBSK did is what I mentioned before, chemistry. SHINee does have quite a bit of it too but it’s just not the same as DBSK. Honestly, I think regardless of the attempt, DBSK was serendipitous. They put a bunch of guys together in a group and it was perfect. It’s like being born into a certain family, encountering certain people and not encountering others. You can’t force things like that and I feel like the chances of that kind of group chemistry happening again, are just as likely as reincarnation. Patricia: Honestly, DBSK’s initial group construction wasn’t anything atypical. The group had members who were vocalists, members who were dancers, members who were just pretty faces. Many other five-membered boy groups are structured in the same way. I think it’s really difficult for a group to debut trying to emulate a well-established senior group, because you never really know how a group is going to grow and develop until they’ve had time to really settle into their career. But that hasn’t stopped people from trying. SHINee is a good example of a group that was probably meant to emulate DBSK, and SHINee’s strong debut made it seem as if they had the potential to be the next DBSK. But things haven’t really worked out that way. There have been some pretty painfully obvious emulations — DGNA The Boss initially received a lot of hate for their similarity to DBSK, at least aesthetically — but I don’t think any company worth their salt would try to blatantly emulate DBSK…or any other group for that matter, because it’s impossible to plot out the career path and success of a group before its debut. There are many who wonder why Yunho and Changmin remained with SM. Did you expect them to make that choice? Do you think that leaving with the other three would have been a better option for them individually, and for the group as a whole? Amy: Good question. I guess if I was told early on before the lawsuit was official that the group was splitting, I wouldn’t have anticipated the group split like it has now. 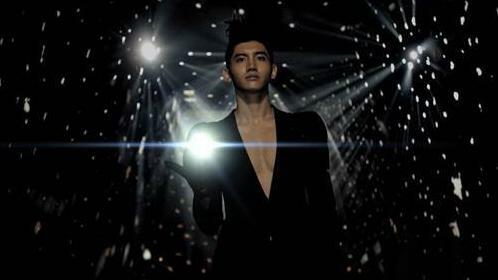 I honestly was surprised that Changmin stayed with SM. Yunho staying with SM makes sense to me because I always felt that out of the five, he was the most grateful to SM for giving him a home when he was in a really tough spot. I don’t want to say that the other members are not grateful, but I think Yunho has the most sentimental ties to SM and has expressed it more frequently than the other members.In terms of impacting the group, I think whatever decision they made, they should’ve acted out together as five. We’ll never know what happened behind close doors, but I think they should’ve done this a la Shinhwa, or hell, even like the cast of Friends, and they should’ve laid all their differences out and presented their issues to SM as a group. Subi: But how can I, or any fan, expect any party involved to make any choice? No one knows what anyone is thinking/feeling, no one know what occurred behind close doors, etc. We’ll also never know which was the better option because as of right now, the only options we can evaluate are DBSK, JYJ, and HoMin. Every writer on this exchange has discussed the pros and cons between JYJ and HoMin and they both have their pluses and minuses. But regardless of JYJ and HoMin, regardless of any possible sub-conglomeration of this group, nothing can be the original, 5 member DBSK. Patricia: Judging from what I know about Yunho and Changmin’s personalities, I’m not surprised that Yunho and Changmin decided to stay. I am surprised that Junsu decided to leave, however; he’s built up many personal and business connections within the SM staff and family, and to risk cutting himself off from all of that seemed very surprising. I think that the principal reason why JYJ decided to leave is that they value their freedom as musicians above their career as idols. It’s not to say that Yunho and Changmin aren’t “real” musicians, but there was probably some conflict in personal morals and goals, which then led to the split. All of this, of course, isn’t to say that DBSK is better off split in two. Regardless of whether the group chose to stay with SM or leave, it would’ve been better if DBSK had stayed as five and made all their decisions as five. Not for the sake of sentimentality between friends and not for the sake of the fans or even for the name DBSK, but simply for the sake of avoiding chaos. Both HoMin and JYJ have had to invest a ton of time and energy and resources to regroup as two separate entities, and all of this could’ve been avoided had they chosen to act together. But then again, as spectators, it’s hard to make judgments about what happened behind closed doors, and all things considered, it’s best to accept things as they are and learn to move on. The lawsuit between JYJ and SM Entertainment is still ongoing, but, eventually, it will come to a close, and there will be an opportunity for closure and for everyone involved (SM, the boys, the fans, the media) to move on. Musically, how do you think the two groups will progress? Both groups seem to have issues blocking their growth — JYJ has been unable to find new audiences (mostly thanks to being cockblocked by the networks), and TVXQ seem to be feel pressured to maintain the DBSK name and fill the gaping holes left by Jaejoong, Yoochun and Junsu. How, do you think they will overcome these hurdles, and would it be for the better with regards to their careers and artistic development? Amy: I feel like some of the writers, myself included, have talked about this ad nauseum so I won’t expound on it too much, but I think a lot remains to be seen with these two groups. I still don’t know if JYJ has found their sound yet because they still are experimenting, which to me is a good and a bad thing. It’s a hugely good thing that they get to experiment with what they feel comfortable with and get to do more of the “real artist” stuff by composing, producing, and experimenting, but at the same time, I’m not a huge fan of the music they’ve put out so far because I think their fortes lie in singing and performing, and not in producing music. This is entirely a personal preference, but that’s why I haven’t been able to get too much into JYJ’s music after they’ve split.With regards to HoMin, I think their music as a whole is stronger (or at least what I’m more used to with DBSK) because they have retained the same musical styles that I’ve come to love from DBSK, but I think their performances are still lacking. I think Changmin and Yunho are doing a great job trying to fill the holes that JYJ have left, but the fact of the matter is, two people just physically can’t do what five people can do, so it’s not something they can attain even if they destroyed their bodies in attempt to do so. 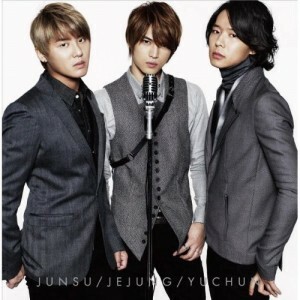 What they have done is re-spin the DBSK brand to suit the HoMin capabilities, which I think is fine.I think JYJ and HoMin will become much better artists overall because of this split — JYJ will have to tackle things like composing and actually making music, and HoMin will strengthen vocally and up their performance capabilities. While I appreciate both sides for being so capable at adapting to their circumstances, I think the DBSK-as-five brand is one that was so specific that it can’t be replicated and I am brand loyal and do ultimately prefer the DBSK-as-five brand over the JYJ and HoMin brands. Subi: JYJ is also experiencing a case of fish out of water. They’re trying to develop themselves as artists. But the thing is, their training is as idols. And because this is the first time they are composing their own music, writing their own songs, etc., etc., it shows. They’re starting from scratch but that may (or may not) change with time and space. The other side has the opposite problem. They’re starting from where the “Mirotic” album ended, which was musically, conceptually, and artistically, a very good place. But they’re taking all the good things about that time in DBSK music and just staying there. Obstacles, regardless of their shape or form, are what lead to growth and for JYJ to grow, they need to stop doing things they want to do and look for things that they can do. For DBSK to grow, they need to move forward, past their comfort zone, and into something new and fresh. And will it be good for them? Yes because at this point and time, their music is good—but it’s not great. Growth is the only thing that can change that. Patricia: I think there’s already a lot that’s been said specifically about JYJ/HoMin’s weaknesses and strengths as two separate entities, but both groups could probably benefit from the same piece of advice: make the best with what you’ve got. As mentioned, HoMin seems to be trying to compensate for Jaejoong, Yoochun, and Junsu’s absences, and their efforts have been painfully obvious and painfully unsuccessful. 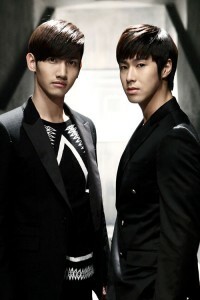 But at the same time, HoMin has the backing of a huge entertainment company, the ability to appear on shows in both Korean and Japan, the privilege of holding one of the most respected names in the K-pop industry, and the ability to build connections with other industry powers without going through the red tape. On the other hand, JYJ is being cockblocked by networks left and right, and they’ve been trying to grab at whatever broadcasting opportunities that present themselves, oftentimes to little avail. But at the same time, JYJ has the ability to write and promote their own music and make their own rules, and the individual members have built up good connections within the K-drama scene (Jaejoong and Yoochun) and the musical scene (Junsu). While both JYJ and HoMin are handicapped in ways that are atypical of most K-pop artists, they also have privileges and opportunities that most K-pop artists don’t have. Rather than trying to follow the fold of the so-called “typical” idol career and constantly trying to compensate for what they don’t have, perhaps it’s best for JYJ and HoMin to make the best of their respective unique situations and see where things lead them. And they say time heals all wounds, but to what extent would you think this is possible with regards to this incident , relationship-wise? Will there come a time when one can mention one group in the other’s presence without Mr. awkward penguin waddling into the room, and can the situation possibly progress beyond that? Amy: This is my least favorite question to answer not because it’s a bad question, but because I’m pretty much a Debbie Downer in my views of this lawsuit. I think this sever in ties is irreversible. Yes, time will heal wounds, and they will maybe eventually all be friends again a couple of years down the road, but I think for a group like DBSK, this sort of divide is a philosophical one where HoMin and JYJ are on two opposing teams. Once the questions spurring this split were raised, they could not be un-raised. Subi: Yoochun recently said in an interview that even if someone were to be the bigger person, the damage has already been done. But he did also say, that maybe with time and space, things could change. The saddest thing about this situation is that this isn’t about 5 idols, 5 singers, or 5 people—this is between 5 friends. And so, it has undoubtedly affected their personal relationships and not in a good way. Based on my personal experience, it depends on the kind of person you are, the kind of person the other people involved are, and what exactly happened and how your thoughts and emotions relate. Is it possible? Yes and no. As much as I love Dong Bang Shin Ki, I don’t think so. Not like that. Do I hope it’s possible? Absolutely. Patricia: I don’t buy that the members haven’t contacted each other even once within the past two years, but I also don’t think that one phone call is going to change anything. JYJ and HoMin have been apart for so long and so much has happened between then that I think it’ll be difficult for things to ever be the same as before, even if all the barriers are someday lifted and the five members are able to be together as they were before. And it’s a sad predicament, but at the same time, it’s also how life works. For most fans, life goes on beyond DBSK — and to a certain extent, I think the same applies to the five members. The DBSK members are full-grown adults who know how to handle their own personal relationships, and it’s not up to their fans to define the members’ relationships between each other or foist their own emotions upon the members themselves. It’s sad to see DBSK break up, because it wasn’t just a break-up between a band; it was a break-up between friends. But like any other broken friendship, one learns to get over it and move on with life. K-pop by its nature is formulaic, but DBSK went beyond that — they seemed to have delved deeper, into the actual music itself. This is what artists do, ones you expect to find in the indie scene, not idols; and I guess this is what makes DBSK so different. You have indie artists that go mainstream, but to see it go the other way? That is special. And like Subi said, it’s not just their musical growth that is the root of their enduring success, it’s their charm, chemistry– heck, let’s just call it the X-factor. Simon Cowell can stop looking for it, because there’s tonnes of it right here. As a new fan, the biggest feeling I get when I think of DBSK is Sad. Sad because I’ve never been able to experience the five of them together, and sad at the knowledge that regardless of how many anecdotes I hear, how many old videos I watch, how many old pics and gifs I see, it’s just not the same. I guess that’s pretty obvious, and it applies to all things, but it still hurts knowing that I’ll never experience first-hand a five-member DBSK. I feel like that’s an incredibly selfish feeling to have, but there you are. Funnily, I wanted to avoid talking about the split, yet most of my questions ended up being about it. I think it’s because I’ve only ever properly experienced the boys as JYJ and new-DBSK, and that is my reality, so I guess it’s natural for me to ask about the events that birthed these groups. But I’m glad I asked them, because Amy’s, Subi’s and Patricia’s answers really hit home. They’ve moved on, and so should I, by putting a stop to this quasi-yet-still-kind-of-real-but-still-selfish-grief and just getting on with it. I personally don’t think the five will ever get back together professionally,so these two groups are as it good as it gets for me. I guess all that I want is for them to be able to be around each other without it being awkward — perhaps not appearing on variety shows at the same time, but at least not having to worry about when to promote material so as to avoid the other group, or at the very least for them to be able to turn up to the same award shows and other end-of-year specials without people having to worry about keeping the two parties as far away as possible. They don’t have be all chummy for the cameras or anything — just no awkward penguins. That’s not too selfish a thing to want, is it?